Some of these accessories include items like spare batteries, folding bags, seat cushions and travel bags. For our first new accessory of 2019, we are more than proud to present our Local Mobility Mini Hoist! Our hoist has been created with our customers in mind. We've had many customers come to us with the same issue! They're starting to struggle when it comes to lifting their mobility scooter and placing it in the car boot. Well this takes away that issue. You just attach the folded up mobility scooter to the hoist and it lifts it into the car boot! The hoist itself is attached to your boot. We have developed it to make sure that you still have as much storage space as possible when it's not in use. We've made sure that all of our customers and users will be able to correctly and safely use the hoist on their own. 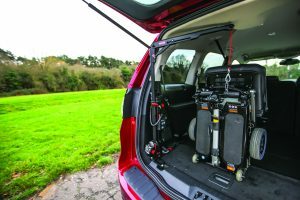 There are two different styles of hoists currently available; the Local Mobility Mini Hoist with Carabiner Attachment and the Local Mobility Mini Hoist with T Bar Attachment. Both hoists are nearly identically. The only difference is the attachment. The carabiner is only suitable for the Standard Luggie whereas the T bar can be used with any from our range of folding mobility scooters. Both of our hoists come with a 12 month manufactures guarantee and we also offer a free fitting as standard! And don't worry, our fitters can come to you to fit your hoist if you're not able to come to our showroom. If you have any questions or you'd like some more information on the hoists or any of our scooters or accessories, don't hesitate get in contact with one of our team today!